Directions:San Mateo, south of East Central, east on Kathryn, south on Cardenas. 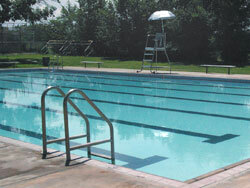 Wilson Pool is a 25-yard shallow, outdoor pool. See our swimming pool fees. Find out more about swim lessons. Practice is Monday through Friday from 9. a.m to 11 a.m.
Monday through Friday Noon - 5 p.m.
Friday night 5 p.m. - 7:30 p.m.